August 17th 2016 was a rather important milestone. It was one year exactly since I pressed publish and published ‘Playing with Plant Pots: Tales from the allotment’. This is the first of two books, and was the start of an interesting adventure. #Plantpottales was the product of fevered writing, and a deep rooted desire to share what I have experienced whilst having an allotment. Based upon this blog, the book extends to some extend some of the learning that is documented in these cyber-pages. I didn’t write it to replace, but as an accompaniment. It is an additional source of information, that can be accessed and used. I wanted to write a book, it seemed a challenge and a good thing to do! It call came from guest blogging, and with encouragement that is the legend https://mrplantgeek.com/ He is also the chap who indirectly helped create the #bollywoodgardener. Without his encouragement, I don’t think the book light bulb would have switched on. It was not easy to write the book, I had a list of ideas and wanted pictures. Throwing together is probably a better description, as I remember having all sorts running through my head. There was distinct movement from being an allotment garden blogger to an indie author. I had never in the first instance, termed myself an garden blogger-yet this was another lovely group that I have found!-but it did make sense to me; I am blogging about a garden, it just happens to be an allotment garden. This is a dynamic linear development, I am still a garden blogger and I happen to now be an indie author. I self published, don’t have an agent, a publisher; I am also still learning about the process. Didn’t stop me from writing a second book. There is also a cracking good garden bloggers community, that started via the twitterverse https://twitter.com/gdnbloggers and they have also been immensely supportive. There is also the gdbbloggers website where you can find further details. To me, having self published two books is an achievement. It is something that I am very proud of, and want to share with anyone who will listen! I appreciate that not everyone is green fingered, not everyone wants to know about garlic and chilies; yet you never know. There was just something about holding a book with my name on, and knowing that I wrote it. I remember walking passed a bookshelf in a well known book store, it was headed ‘Gardening’. To me that felt like a set of goal posts, and the thought in my head was that one day, I might get there. It is however important in my head to keep a few things straight. In the first instance, I have written about a very niche interest. Gardening and cooking isn’t necessarily everyone’s cuppa tea. So that means that interest in the books might not equal or plumb the depths that heavyweight Gods and Goddesses of Horticulture. Second, Rome wasn’t built in a day-I have been there, I know-and writing is a process. Neither of the books is perfect, but I have given them my all, I will continue to do so. There are further books to be written, I know there are. I am half way-ish writing book three; there have been struggles with that, I can tell you! At the moment, Book four has a cover image but no content, and that is likely to be a gardening book. Book three, is definitely not gardening and is something of an experimental work in progress. I have enjoyed this journey so far, and I do hope that it will continue. And the key word is hope. Hope, as you never know. 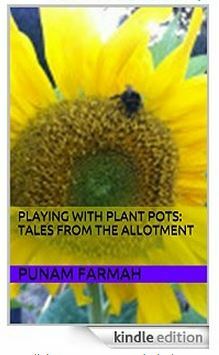 ‘Playing with Plant pots: Tales from the allotment’ is currently on a countdown deal on Kindle Amazon. You can find the ebook at the following links. If you haven’t got an ereader itself, you can always download the app for tablets, devices and PC’s. I realise that summer is now over, and the autumn is descending upon us. Particularly, in the northern hemisphere. Perfect time to curl up with a book. So why not make it this one?